Preheat oven to 450°F. Combine sugar and flour, sprinkle 1/4 of mixture over pastry in pie plate. 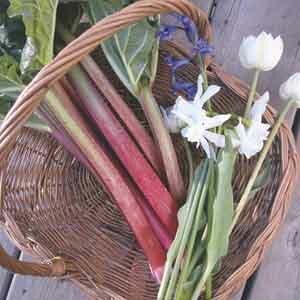 Place rhubarb over this mixture. Sprinkle with remaining sugar and flour. Dot filling with small pieces of butter. Cover with top crust. Bake for 15 minutes on lowest rack. Reduce oven temperature to 350°F; continue baking for 40-45 minutes. Serve warm with vanilla bean ice cream.